November is just about over, but there’s one last batch of incoming streaming titles to consider before next month arrives in earnest: Showtime is adding a number of eye-catching movies and TV shows in December, and we’re here to highlight a select few you ought to know about. Showtime’s slate is most impressive in the feature film department, with Tom McCarthy’s Best Picture-winning journalism drama Spotlight leading the way, though it doesn’t arrive on the service until Dec. 22. 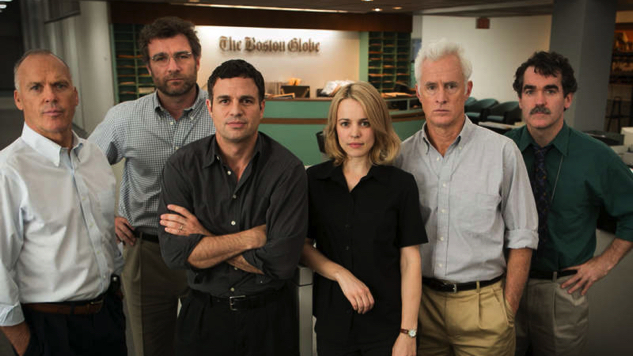 The 2015 film, which also earned an Oscar for McCarthy and Josh Singer’s original screenplay, features an aces ensemble cast, with Mark Ruffalo, Michael Keaton, Rachel McAdams, Liev Schreiber and John Slattery portraying Boston investigative journalists who shock the world by uncovering the Catholic Church’s systematic cover-ups of widespread child molestation. Also worth adding to your queue is satirical comedy The Death of Stalin, from Emmy-winning (and Oscar-nominated) Veep creator Armando Iannucci and streaming on Showtime beginning on Dec. 15. The acclaimed, darkly comic film takes place in the days after its eponymous dictator’s demise, during which his core team of ministers—played by Steve Buscemi, Simon Russell Beale, Jason Isaacs and others—scrabble for control of the Soviet Union. Those are just a select few of Showtime’s watch-worthy December film additions, which also include Mel Gibson epic Braveheart, eerie cult drama Donnie Darko, seminal slasher film Friday the 13th, baseball classic Major League, star-studded Western Tombstone, Brian DePalma’s Oscar-winning organized crime epic The Untouchables and all-time-great rom-com When Harry Met Sally, all of which arrive on Showtime tomorrow, Dec. 1. Don’t overlook the rest of Showtime’s December slate: The streamer is adding new episodes of Emmy-winning drama Ray Donovan, currently in its sixth season; ditto prison-escape event series Escape at Dannemora, the impressive TV directing debut of one Ben Stiller, and political docuseries Enemies: The President, Justice & The FBI, which airs its Alex Gibney-directed, feature-length finale episode on Sunday, Dec. 9 at 8 p.m. ET. Elsewhere on Showtime, you can catch a handful of music documentaries, including (but not limited to) Jeff Beck: Still on the Run on Dec. 11 and GG Allin: All in the Family on Dec. 13, and Showtime’s handy streaming collections, which in December focus on Christmas films, Nicole Kidman-starrers, romances and more.